In response to several requests, I put together a webinar on my favorite marketing techniques. And of course I recorded it. 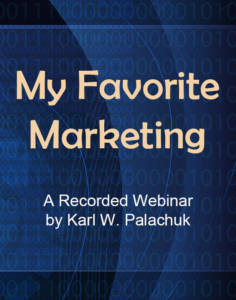 In this webinar I present my three favorite marketing techniques. These techniques brought me almost every client I’ve signed to managed services for the last twenty-three years. Includes questions and answers at the end. Webinar MP4 and Slides in zip format.